And do our subscribers have fun with our feast of Christian humor and jokes pastors can tell. Our award-winning newsletter, The Joyful Noiseletter, provides churches with a bountiful bimonthly supply of reproducible cartoons, clean jokes, one-liners, inspirational stories, and joyful Scripture references. 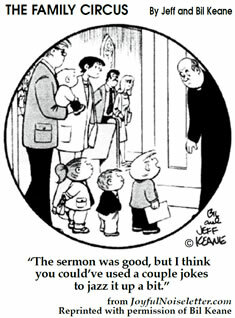 Local church publications and church web sites reprint JN’s anecdotes and priceless cartoons by 18 of the nation’s finest cartoonists, including Bil Keane, creator of The Family Circus, and Dave Coverly, creator of Speed Bump. Subscribers regularly receive in JN a bonanza of delightful cartoons by 18 of the finest Christian cartoonists. These cartoons are related to current events, church calendars, holidays, and the changing seasons. The cartoons in JN may be reprinted in church newsletters, bulletins, fliers, posters, signs, and letterheads free-of-charge and without seeking permissions. They also may be projected on overhead screens. Pastors and lay speakers use JN’s fresh and timely holy humor and cartoons in their sermons and presentations. And Sunday school teachers, youth pastors, chaplains, and health professionals find the healing humor in JN invaluable in getting the attention of children and teenagers, and cheering up hospital patients, depressed parishioners, shut-ins, and the elderly. Subscribers have the option of receiving the paper or electronic version of JN. The electronic version is mailed directly to your e-mail box, where you can easily cut and paste the articles, jokes and cartoons directly into your church publication. The Joyful Noiseletter's subscribers include pastors, church newsletter editors, health professionals, chaplains, humorists, comedians, cartoonists, clowns, public speakers, toastmasters, lay church leaders, youth ministers, and lots of people who just enjoy sharing good, clean humor and healing laughter. "I've been on the road giving seminars across the country. It's delightful to note the presence of The Joyful Noiseletter in so many congregations across the land. "JN's fame is widespread - as ought to be the case for a publication which easily buries the concept of Christianity as a 'joy-killer.' Truly, it's a 'joy-instiller,' as your witty comments, puns, holy humor, and cartoons bring out in every issue. The Joyful Noiseletter is the best humor publication in Christendom. Keep up the great work!" 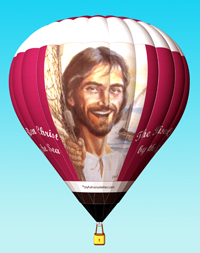 Sky Sail Balloons, Inc. of Ashville, NY, in cooperation with The Joyful Noiseletter, has produced a new hot-air ride balloon that features the iconic painting "The Risen Christ by the Sea." The inaugural flight of the balloon is planned during the Easter season. Sky Sail plans to exhibit the balloon at balloon festivals and rallies across the U.S. and around the world, subject to sponsor support of individuals or organizations." 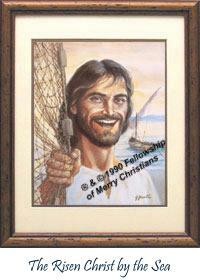 "The Risen Christ by the Sea" was painted by a Massachusetts seascape artist, the late Jack Jewell, at the suggestion of a friend who was then a chaplain to the New York Fire Department and the predecessor to the only NYFD chaplain who was killed in the 9/11 Twin Towers tragedy. To learn more about the Risen Balloon, go to www.skysail.org. A MESSAGE FROM PATCH ADAMS, M.D. The Joyful Noiseletter was launched 33 years ago after the editors visited a seminary library and could not find the word “humor” in the book index. JN will be celebrating in 2018 its 33rd anniversary of publication as a newsletter which has filled the sanctuaries and fellowship halls of thousands of churches of all faith traditions with healing laughter. The Joyful Noiseletter amazingly has survived as both a print and electronic newsletter – without advertising – during a prolonged recession and the demise of many secular and religious publications. JN began publishing with the aim of bringing good, clean humor to pastors, church newsletters, bulletins, and web sites – jokes that pastors can tell in their sermons, and holy humor and cartoons that local church publications can reprint. JN succeeded on a bare-bones budget because of a massive, mainly volunteer effort involving hundreds of talents from many faith traditions all over the world – humorists, comedians, cartoonists, clowns, pastors, chaplains, medical doctors, nurses, health professionals. Hundreds of humorists, comedians, and clowns, including Steve Allen, Joe Garagiola, Malcolm Muggeridge, George and Peggy Goldtrap, and Rev. Susan Sparks have contributed freely to JN. Eighteen of America’s foremost cartoonists, including Bil and Jeff Keane of “The Family Circus,” Johnny Hart of “B.C.,” Dave Coverly of “Speed Bump,” Ed Sullivan, and Harley L. Schwadron, contributed cartoons to JN that were widely reprinted in church publications. JN editors soon discovered that holy humor, like love, crosses denominational lines, and is an important healing, bridge-building, and peace-making tool. The editors also discovered that holy humor is the one thing that all of the great religions agree on and value unanimously. JN has attracted subscribers from a variety of faiths that ordinarily rarely communicate. The holy fools of JN sometimes have gone where angels fear to tread. JN’s set of four Holy Humor and Holy Hilarity books by Cal and Rose Samra (published by Guideposts and Waterbrook Press) and the book The Joyful Christ: The Healing Power of Humor (Harper San Francisco) sold nearly a million copies. Over 33 years, JN received, collected, and cataloged 380 books on Christian and Jewish joy and humor by authors from a variety of faith traditions. Prof. John Morreall, chair of the department of religious studies at the College of William and Mary in Williamsburg, VA, recognized the value of this unique treasury of books, and plans to reference it for his new book, Divine Comedy. JN carried articles on how minorities have used humor as a survival tool for centuries. The holy humor and joyful Scriptural messages in JN’s “Signs and Wonders” section are often posted on outdoor church signs. Numerous clowns use JN’s materials to cheer up shut-ins and patients in hospitals, nursing, and retirement homes. Hospital and military chaplains use JN materials to lift the spirits of those they are counseling. The Joyful Noiseletter’s Facebook, monitored by Methodist Pastor Dale Schoening, has attracted a loyal and growing following of wits and lively exchanges. The Joyful Noiseletter resurrected “Bright Sunday,” a very old service on the Sunday after Easter when the early Greek Christians celebrated God’s last laugh on the devil by raising Jesus from the dead. 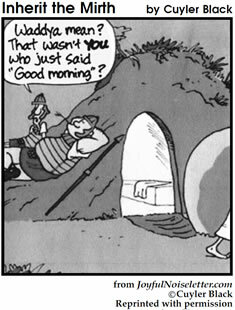 The early Christians spent the day picnicking, singing, dancing, joke-telling, and playing practical jokes. Bright Sunday became “Holy Humor Sunday,” and Newsday reported in 2013 that “Holy Humor Sunday has become an increasingly popular practice on Long Island and nationwide” that marks the Sunday after Easter with skits, joke-telling, dancing, singing, practical jokes, and picnicking in an ongoing celebration of Jesus’ resurrection. Newsday reported: “The effort by The Joyful Noiseletter has prompted hundreds of churches across the country, mainly Protestant, to revive the old Christian practice.” So popular have these services become that some churches last year celebrated their 15th annual Holy Humor Sunday service. Thanks for listening to our story. By the grace of God, we survived for 33 years. We welcome anyone who wishes to share holy humor and subscribe to The Joyful Noiseletter for just $29 annually. You may subscribe on this web site. Or call toll-free 1-800-877-2757.